All roads lead to Kilbogget Park on Sunday next when the club host their Family Fun Day. The event gets under way at 1 p.m. and thereâll be lots of activities for the young and the not-so-young and a fun and enjoyable day is assured! The highlight of day will undoubtedly be the Cornerstone Cup when a combination of the minor and junior teams take on the mentors and parents. Keith Hughes will manage the mentors / parents team and the successful minor B management team of Bernie Hedderman and Denise Connor will look after the Minor B / Junior team. 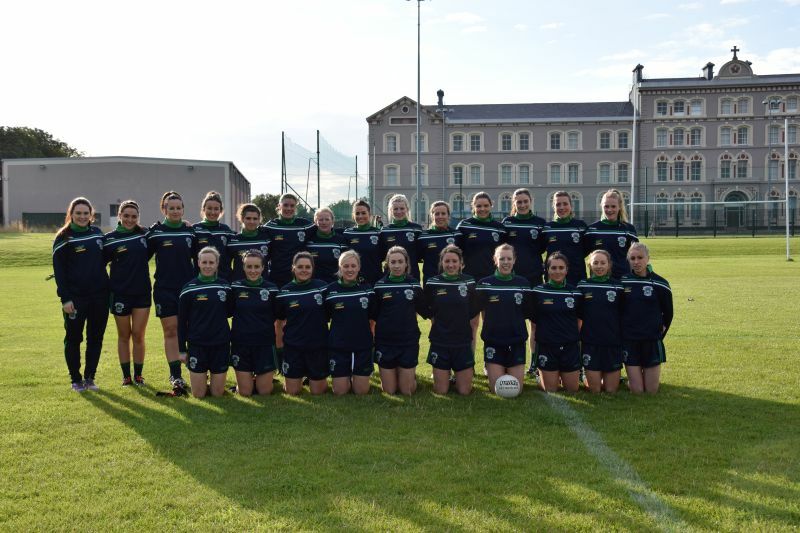 We have teams entered in all the underage championships and the U14 division 1 team were the first team in action on Friday evening when they took on Na Fianna. After a cracking game of football they fell short and lost by 2 points. The U14 division 5 championship game against St. Patâs Donabate was moved to a later date at the request of St. Pats. The U13 division 2 team had a great win over Ballyboden while the division 4 team lost by 1 point to St. Maryâs Saggart. On Monday, our Minor division 1 team play Templeogue Synge Street and our division 4 team play Ballymun Kickhams. The Academy resumes on Saturday morning following the summer break and Derek and Naomi are looking forward to welcoming all players back. Best of luck to Sinead Goldrick, Amy Connolly, Hannah Noonan, Niamh Collins and Niamh Ryan who are members of the Dublin ladies senior panel who play in the All-Ireland semi-final on Saturday next against Armagh. The game was originally fixed for Parnell Park with a 5 p.m. throw-in. However, the replay of the menâs semi-final between Dublin and Mayo has been set for 5 p.m. in Croke Park so the ladies semi-final will now take place earlier on Saturday. The time is not yet known but once we know, weâll put the information on the club web site, Facebook page and twitter account. One would have thought that it would have made sense to play the ladies semi-final in Croke Park before the menâs replay, but at the time of writing these notes, that doesnât appear to be a runner. Just a reminder that the rescheduled Family Fun Day is taking place on Sunday September 6. Thereâll be lots of fun and activities for the young and the not so young. Members of the newly crowned Dublin Ladies Senior Championship team will be present with the Michael Murphy (Dublin Senior Championship) trophy. Niamh Ryan who was half forward on the Dublin U21 team will also be present with the Aisling McGinn (All-Ireland Ireland U21) trophy. The showcase event of the day will be the Cornerstone Cup game between the Minor / Junior selection against the Mentors / Adults team. The postponement from June has given the Mentors / Adults team some extra time to get in some more training and thereâs been a noticeable increase in activity around Kilbogget in recent weeks and this will make team selection even more difficult. Congrats to Sinead Goldrick, Amy Connolly, Hannah Noonan, Niamh Collins and Niamh Ryan who were on the Dublin Senior Ladies team who beat Monaghan in the All-Ireland quarter final on Saturday. Dublin will play Armagh in the All-Ireland semi-final on September 5th. Recently the Club reviewed and updated its Codes and Practices in line with Irish Sports Council recommendations, GAA recommendations, Go Games recommendations, along with best practices from other GAA clubs and sports codes. This was on the basis of recommendations forwarded by a subcommittee who worked for many months collating and assessing best options. These were adopted by the club Executive and incorporated into a club handbook. In a recent club notes e-mail, circulated on July 19th, the club Executive informed members of this recently approved Club Handbook, along with the requirement that all acting Squad Managers/Lead Mentors/Mentors, sign "Acceptance of the Club Codes, Policies & Procedures" by August 5th. This is to ensure best practice and governance, are adhered to within the club. Subsequent to this e-mail, clarification was sought by some acting mentors on issues within the handbook. This was provided and Appendix 6 was added to the Handbook to reflect this. Despite providing these clarifications, and in some cases amendments, a small group have not yet signed the acceptance document. This is a very serious matter for the club. Therefore, those who have not signed,cannot be involved in any team activities, until the acceptance document has been signed. Dublin Ladies Senior Champions 2015. Isnât that lovely to read! Friday August 7 2015 will go down as a red letter day in the clubâs history as it was the day that the club won their second Dublin senior championship in 4 years. The opponents were St. Brigidâs; the final score was Foxrock Cabinteely 3-10 St. Brigidâs 2-1 and the match was refereed by Billy OâConnell from the Croi Ro Naofa club. Brigidâs opened the scoring after 4 minutes with a point from full-forward Elaine Kelly. This would be the only time in the game where Brigidâs were in the lead. Hannah Noonan got the teams level with an excellent point and this was followed by points from Amy Ring and Sinead Goldrick. Hannah Noonan was on the mark again with a point a few minutes later and just before half time Foxrock Cabinteely blitzed Brigidâs by scoring 1-3 without reply. Amy Ring got the all-important goal, Hannah Noonan scored 2 more points and Amy Connolly got the other point. The half time score was Foxrock Cabinteely 1-7 St. Brigidâs 0-1. The second half started with Foxrock Cabinteely dominating proceedings and Player of the Match Sinead Goldrick got her second point of the match a few minutes after the restart. Laura Nerney tagged on another point soon after and this was quickly followed by a remarkable goal from Amy Connolly. Amyâs goal was without doubt the score of the game as she took possession on the 45 and beat most of the St. Brigidâs defenders to blast the ball past her Dublin team mate Ciara Trant. Foxrock Cabinteely were awarded a penalty a minute later when Amy Ring was fouled and Anne Marie Murphy took the spot kick and slotted it comfortably past the Brigidâs keeper. Amy Connolly finished off the Foxrock Cabinteely scoring with a point. St. Brigidâs never gave up and this perseverance was rewarded with 2 goals before the end of the game. Billy OâConnell blew the final whistle to bring proceedings to and end and players, management and supporters rushed onto the pitch to savour the moment. A little while later the team made their way to the presentation area where Sinead Goldrick was named as Player of the Game. A few moments later team captain Fiona Claffey was presented with The Michael Murphy Cup to thunderous roars from the many Foxrock Cabinteely supporters. The panel for the game was: Carol Manning, Nuala Mohan, Aedin Murray, Sinead Delahunty, Sinead Goldrick, Sarah Brophy, Fiona Claffey (Capt. ), Marla Candon, Laura Nerney, Niamh Collins, Anne-Marie Murphy, Ciara OâRiordan, Amy Ring, Hannah Noonan, Amy Connolly, Ellen Dooley, Ciara Crotty, Niamh Ryan, Lorna Fusciardi, Laurie Ahern, Ciara Murphy, Cara Cooke, Elaine Bolger, Sinead Loughran, Eimear O'Herlihy, Hannah Foster Ryan, Hannah OâNeill, Tarah OâSullivan, Olivia Crosson and Emma McDonagh. Well done to all concerned and we look forward to the ladies bringing the cup to our younger teams when they resume training later this month and they might even take a few sessions! A sample of photos from the game are available here on the club website. Thanks to Mitchell Brophy for sharing these. Members can view more of Mitchellâs portfolio by visiting his Facebook page.